Melbourne, FL (November 15, 2018) – Trinetics Group, an American manufacturer and global leader in plastic welding and contract assembly, has partnered with Yardley Products to manufacture its all-new digitally enhanced Thermal Inserting Press 2.0. The Thermal Inserting Press 2.0 provides manufacturers the ability to circumvent the typically expensive and complex ultrasonic equipment required to install threaded metal inserts into thermoplastics. For manufacturers working on 3D printing, prototyping, or low volume production, the Thermal Inserting Press provides an inexpensive option requiring little investment and space to produce the same quality end-result. The new version of Yardley’s Thermal Inserting Press 2.0 also includes an all-new digital display with digital controls, to allow for very accurate temperature control. The ability to control the temperature prevents damage to plastic while also providing a strong, permanent installation of inserts with high resistance to rotation and pullout. The Thermal Inserting Press 2.0 can be upgraded to fit any manufacturers’ specific needs. Not only can it be used to install inserts into plastics, but it can also be custom to do other tasks such as removing inserts from plastics and heat staking. 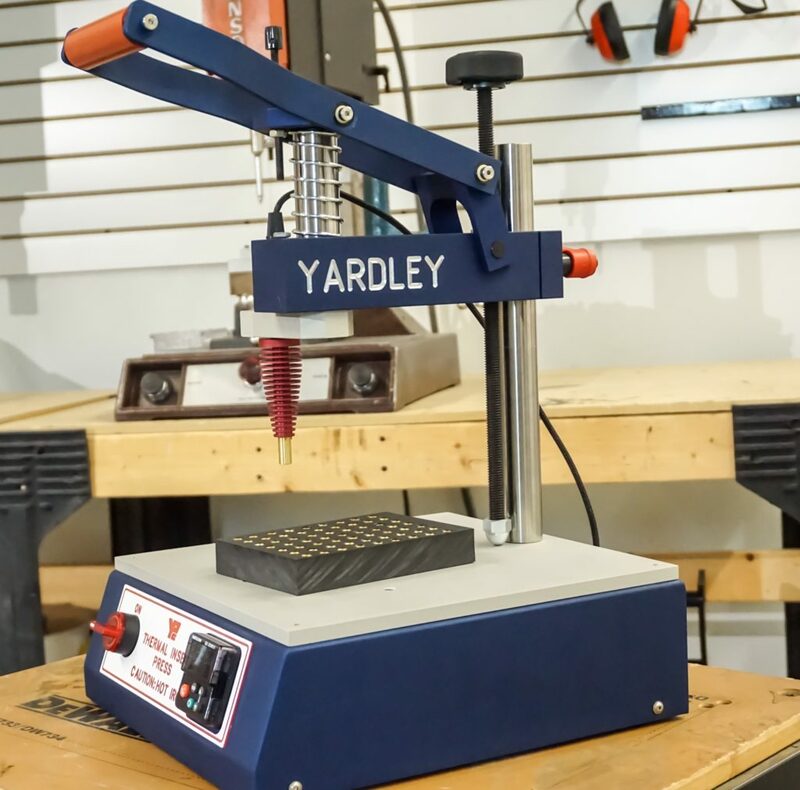 Due to increased demand, Yardley Products reached out to James Stern, Vice President at Trinetics Group, for a way to increase production of the thermal installation tool. While developing a more efficient way of producing the thermal press, Stern and his team also took the initiative to improve the original version of the thermal press. Along with updating the digital display for accurate temperature control, Trinetics incorporated other updates to make the process of using the thermal press more repeatable, including an improved arm linkage. All of the painted parts were also upgraded to hard, anodized parts, giving the thermal press a higher quality finish. The manufacturing experts at Yardley Products are able to provide custom configurations of the Thermal Inserting Press 2.0 upon request. The standard Thermal Press 2.0 is available for purchase online. If you would like to order more than one, please request a quote for discounted pricing. Trinetics Group has been a leader in contract manufacturing and plastic welding for over 30 years. Equipment made and designed has serviced virtually every market in the plastic joining industry: including medical, appliance, automotive, computers, business machines, toys, electronic packaging and more. Trinetics Group has provided manufacturing services and placed equipment in Fortune 1,000 companies throughout the world including the United States, Canada, Mexico, England, Germany, Egypt, Indonesia, Finland, and others. To learn more about Trinetics Group, go to www.trineticgroup.com or call 321.622.8584. Yardley Products is a U.S. manufacturer of high quality threaded metal insert fasteners serving a wide range of fastening applications for OEMs and various other industries. Since 1946, Yardley Products has been delivering standard and custom manufactured threaded metal inserts for applications ranging from furniture and plastics to medical and electronics. Today, Yardley Products offers a large inventory of more than 24 million standard metal inserts ready to ship and can produce custom insert fasteners quickly and affordably.